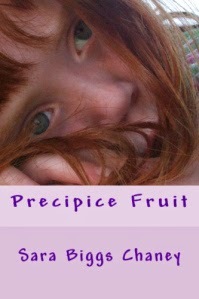 The best place to start talking about Sara Biggs Chaney’s poetry chapbook, Precipice Fruit, is with the afterward. In a courageous and rarely seen (in poetry) break of the “fourth wall,” Chaney addresses the readers of her poems to provide an insight into some of the intentions behind her poems. Jenna is the autistic child whose presence ripples through each poem. Chaney balances three sets of voices that seek to define Jenna. The first set includes the doctors and teachers that refer to Jenna by a set of afflictions or to “normal” behavior. From the second poem in the collection that tells us there are “possible markers of genetic disorder” to the last poem, which provides a 5th grade report card, Chaney includes a variety of found material that portrays how the world outside views autistic children. Chaney uses the mother’s voice to provide moments of absolute beauty with Jenna—“her mouth sings / easy sound, sweet innard / of a thousand little thunders”—to incredibly visual terror—“Jenna’s ribs arch & chase / a magnet to the ceiling. / Her joints do circus tricks.” With this second poetic voice, Jenna is less clinical and more human. Jenna, in the beginning of the book, is not a real person, merely the subject of poems. Halfway through the book, the readers may expect a continuation of the mother’s voice and the clinical coldness of medical records. Although a fantastic way to construct a collection, Chaney does not stop there. She stretches her imagination further and gives voice to Jenna. She states, “Jenna teaches / another way / to be here”. Jenna’s voice is superbly constructed when she states, “I kiss the glass, / make it shiver. // I kiss outside.” Even when Jenna is “writing a script for a television show” or sitting on “a black leather couch next to Charley,” the voice is a child’s. Giving Jenna the space to express herself through the latter half of the book emphasizes the problem with trying to represent someone else’s experiences who may not have the ability to do so themselves. A balance is created by giving Jenna a unique voice without making her a caricature of disability or childhood. Chaney allows the space for Jenna to be the author of her own story, not a subject in someone else’s. Giving space to Jenna to tell the story of herself allows readers to see autism as another state of being and not just “an idea of a girl / dancing in a fountain.” Therefore, the mingling of different voices gives a balanced insight into the world of autism. With every experience represented—doctor, teacher, mother, child—we are left inhabiting the life Chaney has created instead of just reading about it. Chaney takes a remarkable step toward allowing a deeper understanding of how another person, seemingly incredibly different from us, could be considering the world. As Jenna says at the end, “You might like to know: / I have my own strategies. / I am practicing every day”.